New Hop Yard Is In! Well…it took us three days to do it, mostly due to very wet fields on day 2…but all the poles are in and are they beauteous! Even for someone who’s used to walking amid these 20′ giants, to see 45 of them jump out at you as you drive up the Sportsman’s Road, all standing neatly in their rows in a wide open field…it’s moving. Day 1 was November 9, and sure as shooting, our contractor Dave Kroenenwetter and his rig operator Robyn, showed up right on time at 8am. My typical early morning drive to Saint Marys from State College, 90 minutes in all, lends itself to a lot of thinking and reflection time. I was a bit more stressed than usual I must admit because none of us, including the driller, had any idea how long the process might take or how difficult it could be. I always plan for the worse and hope for the best, something I learned very early on from my parents. Sage words of advice for anyone, particularly a Farmer! First pole augering is underway. I also added moldable aluminum caps to the poles the previous week. This was another of Tom Carey’s stellar recommendations. Even though we are working with the highly rot resistant black locust poles, those ends are exposed to the weather all year long and are the most porous given that they open up to the inner of the tree. I found some of this aluminum sheeting those roofers use for flashing purposes, cut the pieces to size and nailed them to the tops. There is a tar/sticky side that goes down against the pole and helps it to adhere. For the inner three rows of poles, I’d also drilled in galvanized eye hooks as we may be running the cables over top of the poles and through these eyes versus wrapping the poles like we will with the outer rows. 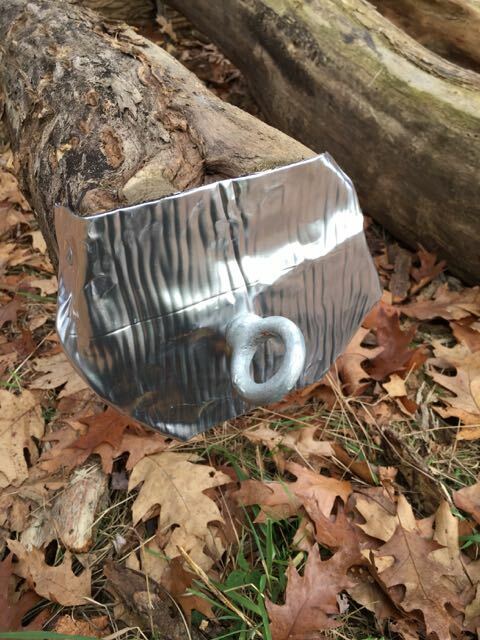 All our poles are capped with this flexible, sticky aluminum flashing. The three center rows also have galvanized eye hooks the cables will run through. My Dad and I had staked out all the pole locations the week prior. 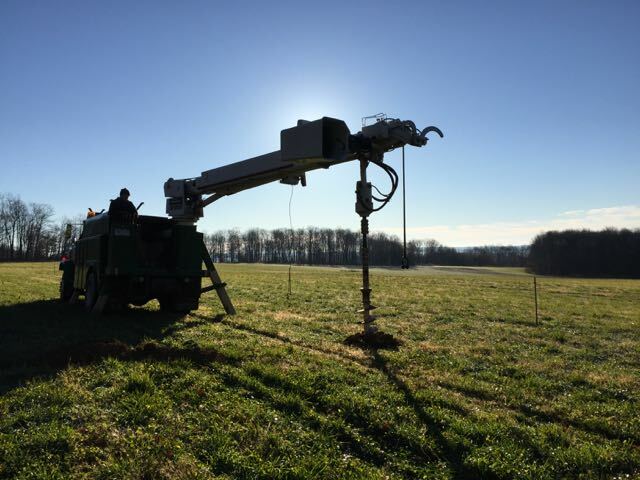 As I stood there looking at a field of 4′ poles staked in the ground, I had no idea how I’d feel once the real ones were safely in place and ready to go. As we got started on the first day, Dave helped get things and place but then left to attend to other jobs in the area. Our very good friend and neighbor John Sharrow stopped up not long after to lend a hand, just as he has volunteered to do so on many other occasions. John brought his ATV and trailer, which he used to fetch rocks from the many piles we’d just created earlier to prep for the barley. Initially Robyn would run the truck and I would guide the auger to the exact spot, however it was looking like once we started to drop in the poles, we’d probably need another hand as John and I would be backfilling the holes with rocks and dirt to secure the pole. As such, Robyn called up his son Bubba to join us on the worksite. Those two have worked often on various jobs and it shows…it made the process move along more smoothly. First pole angering under way! from Joshua Brock on Vimeo. We moved slowly and methodically through the field and by noon, had all the holes angered…this was proceeding about as well as I could have hoped for! We then drove the truck over towards the existing hopyard to grab the three extra poles Dad and I debarked earlier in the Summer. Dropping the extra poles off at the new hopyard. By the end of the first day, we had just about half of the poles in place. I had scheduled two full days in the budget and damn if that didn’t seem like it was going to happen that way as planned. And then…came the rains! Our second scheduled day, November 16, arrived following a few days of rains that had come and passed. My hope was that by now the field would have dried out…well, not so much. Yeah, not looking so good. With the truck rolling through the aisles, heavy enough by itself but then also towing the trailer of poles, it just made a mess of the wet fields. Where the truck slid into one of the holes. Wet fields and augers do not good friends make from Joshua Brock on Vimeo. As a result, the second day…pardon the pun…was a wash. The next day available for Robyn and Bubba was just three days later, November 19. We were running up against a couple deadlines; hunting season where Robyn and Bubba would be unavailable for two weeks, the possibility of snow falling and my work schedule. When they said the 19th was open, I made changes in my regular work schedule and came up early that morning. Yet another recommendation from Tom was to have pulverized lime available. He’d had an ol’e timer Farmer once use it at his Farm when Tom’s tractor was stuck with the tires spinning. Throwing it under the tires did an amazing job of sucking the moisture out of the ground. I bought three bags of it and was using it under the truck tires and it seemed to be making a positive difference! As the morning moved on, the field began to dry out which helped immensely. With John back on the scene and Robyn and Bubba doing their thing, we got back on track and finished dropping in the last of the poles around 1:30pm. Snapping a picture after day 1 was complete. Didn’t know what was ahead of us on day 2! Start of day 3. The trailer was left in the field the previous work day as it was too wet to move any further through the field and had to be left behind. Day 3 and our last load of poles! Robyn (on the truck) and Bubba setting the last pole. Last pole going in from Joshua Brock on Vimeo.